The Turneffe Crab has become a standard for permit and bonefish in Belize at Turneffe Flats and other locations. Great fly design by Craig Matthews - this is a very nice fly, and lighter in weight than some crab patterns making it useful for shallow water and for areas where fish are skittish. See below for size reference photo of the #6 Turneffe Crab. 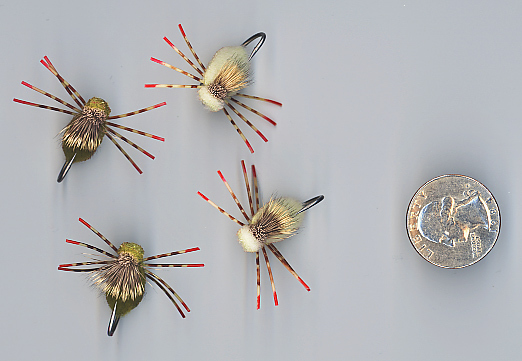 The Turneffe Crab is tied by Umpqua Feather Merchants. Fly design by Craig Matthews. Other flies for Belize & Turneffe Flats include the Bonefish Bitters, the EP Micro Crab, and the Turneffe Micro Shrimp. Other Crabs: EP Permit Crab, Chernobyl Crab, Del's Permit Crab / Merkin. For more info, you can also check out this "Turneffe Flats" suggested fly selection webpage (external link - please use your browser's "back" button to return to Saltwaterflies.com.